Boost your online sales with the #1 upselling technique from Amazon. Empowered by Beeketing AI for eCommerce. 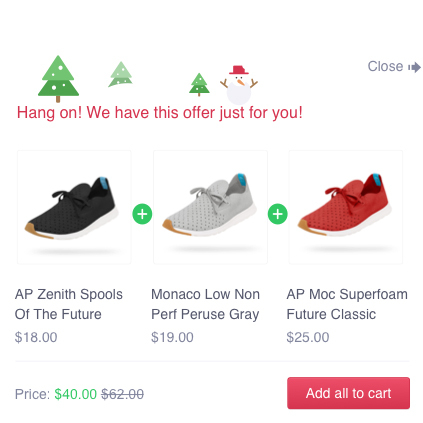 Upsell empowers you to suggest customers higher-end alternatives or relevant products so you can easily increase average order value from all orders. 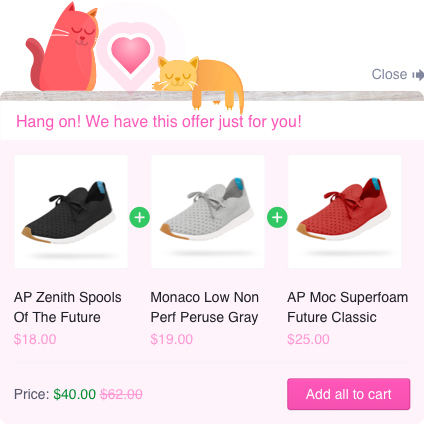 When visitors add an item to cart, a popup will appear to upsell them a list of better options that they might be interested in. 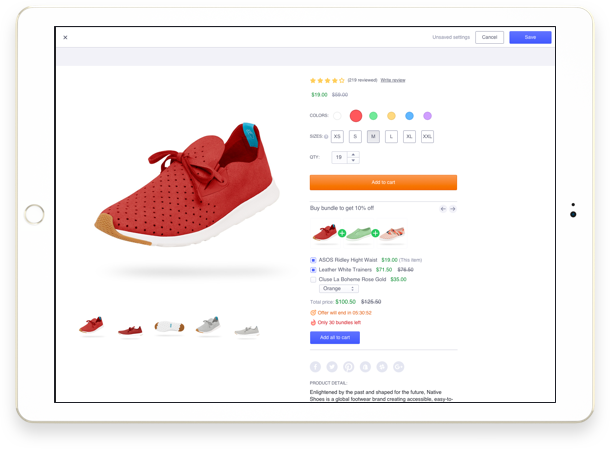 If enabled by you, Boost Sales will use Beeketing AI to automatically pick up the most appropriate products to recommend based on customer's shopping behavior, and increase sales for you. Cross-sell helps you to bundle up products that go well together into a product bundle for your customers. 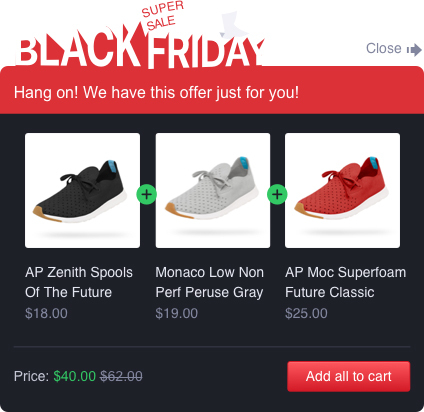 When customers view any product in the bundle, a corner popup will appear with special effect to catch their attention and suggest the whole pack. You can freely choose the ways your cross-sell bundles display, as popups or embedded widgets right in the products descriptions (like Amazon’s doing). You can also offer discount coupons to promote your valued deals even better, and significantly boost sales from any existing customer. Furthermore, you can activate Beeketing AI to automatically create smart cross-sell offers as well. 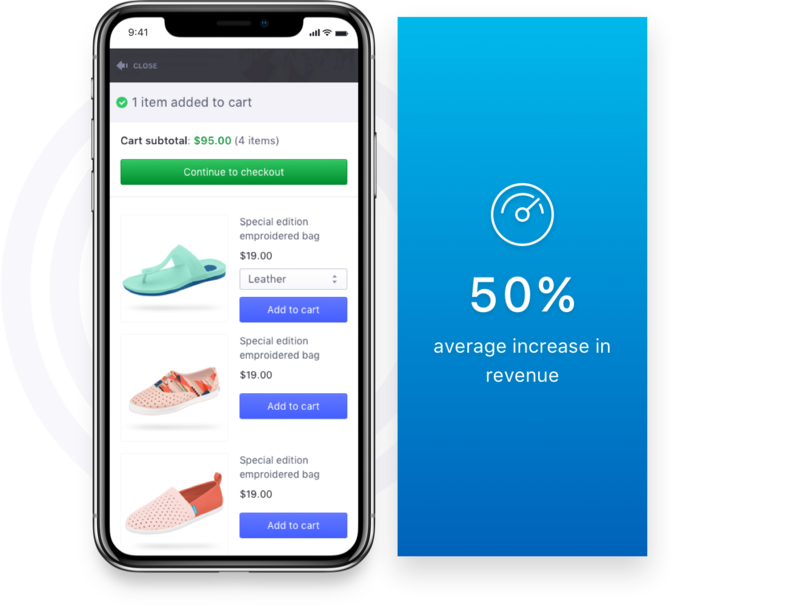 Using machine learning technology (Beeketing Artificial Intelligence), Boost Sales automatically creats offers and suggests them to the right customers based on their browsing behaviors and your order history. Thanks to the smart one click upsell and cross-sell, it's no need for you to worry about what upsell & cross-sell offer really works and what doesn't. Boost Sales will take care all of it for you. 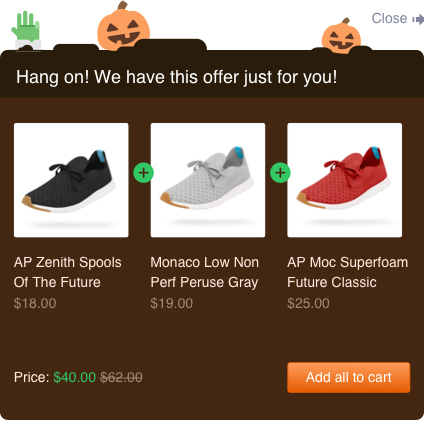 Do you know that upsell at cart page is reported to reach 5-10% conversion on average? 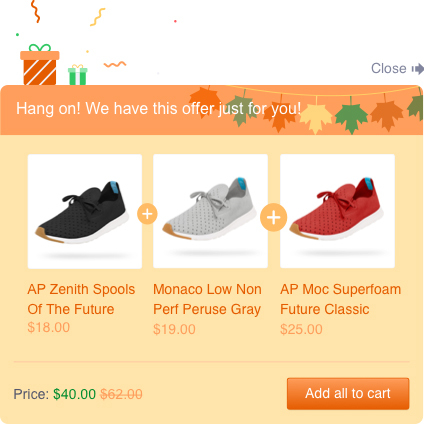 When customers click “Check Out” button in cart page, one last upsell offer will show up to suggest them more items they might want to add before checking out. These products are well-chosen based on their shopping behaviors and your sales history, which makes customers more likely to purchase. Online shoppers love discount deals like sweet candies! Boost Sales helps merchants sell more easily by allowing them to seamlessly choose several types of discounts for their product bundles. 51% of customers are shopping on their mobile phones & tablets. We've optimized UI and UX of Boost Sales on both desktop and mobile devices to make sure your customers have the best shopping experience. Holiday season is always the best time of the year to skyrocket your online sales. Therefore, a Holiday Themes Collection was carefully designed to help you decorate your storefront, making your upselling and cross-selling offers highly converted on the special sales craze each year. To help you track what types of offer work best and optimize them for a better performance, we provide a detailed report on every single offer. Everything is straight-forward, precise and easy to follow so you can take quick actions. "We have researched thoroughly and found this app. Highly recommend to install this app as it pays himself a monthly subscription cost (after trial period is over) within a week so all you are looking at is purely positive result." "Awesome app! Easily customisable and gives great results. Contact the support team from within the app for any issues you're having, they're always willing to help and very quickly, too. Great team and great apps." 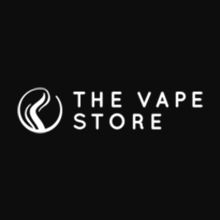 "Great app and great service! Support has been very responsive and quick to do so. Since installing our average order size has nearly doubled." 7-day free trial. Cancel anytime. No risk. Your pricing may vary depending on your traffic and orders.